Genetic diversity is the foundation of the genetic improvement of crops. IRRI seeks to understand rice genetic diversity and uncover new genes and traits in rice that will help rice producers face challenges brought about by climate change, pests and diseases, and other unfavorable conditions. Although the vast catalogue of more than 50,000 rice genes has been mapped as a result of recent advances in biotechnology, most of their functions remain largely unknown. Thousands of undiscovered genes may have the potential to benefit rice productivity and quality and we are now working to decipher their functions using cutting-edge science. This work draws together conservation of different types of rice, diversity analysis, gene discovery, and dissemination of advanced genetic and breeding resources. It presents a unique opportunity to maximize the use of conserved traditional and wild types of rice and modern rice varieties. IRRI is home to the International Rice Genebank, the world's largest repository of rice genetic diversity, with more than 132,000 rice accessions and wild relatives from all over the world. 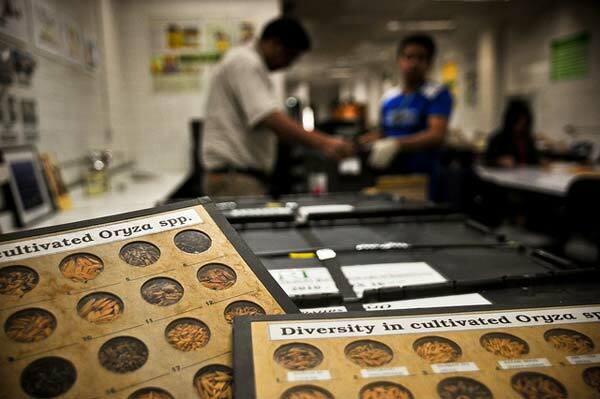 With international treaties and agreements ensuring the equitable and responsible sharing and use of rice genetic diversity, IRRI provides seeds for free to farmers and researchers. Several online systems are available to help you find data on rice. Our crop informatics work provides support to research through a unified crop information system for data management, integration, and use. Our work promises quality-assured germplasm-centric data. You may also view a video playlist on the 7th International Rice Genetics Symposium.